Celebrate Christmas and Christ's Birth. 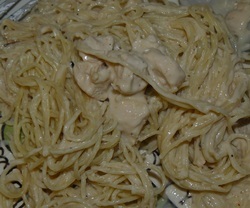 Make your favorite pasta and use angel hair pasta as the noodles. Using waffle cones or sugar cones (same as ‘Tree Night’ so we used leftovers), break the edge of the cone slightly to even it out. Stick a large marshmallow in the back to keep it standing up. Melt the almond bark in the microwave according to the directions (do not burn). It was helpful to ‘glue’ the cone to a little plate with the melted bark. Put melted bark on top of the cone and push a donut hole down on top to make the head. Make wings by pouring melted bark onto wax paper and letting cool (place in fridge to speed process). 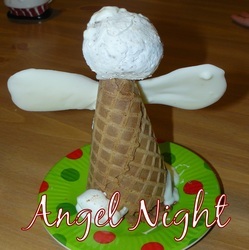 If kids are old enough, this is fun for them to make their own wings. Once wings are dry, glue them to the cone with additional melted bark. Print template on cardstock or heavy paper, color and then cut out cone shape. Glue or tape cone together. Using markers, color 2 coffee filters. Place the coffee filter in a bowl and use a paintbrush to sprinkle water over the colored areas. This will cause the marker to bleed down the filter. Let dry. Glue a cotton ball onto the top of the cone. Fold one coffee filter into fourths then glue onto back of cone. Repeat with second coffee filter and glue onto the other side. These will be the wings. If it has snowed outside, go make a snow angel. Other options include dressing up in a sheet and and performing your best angel act or our family favorite which is karaoke in your best angelic voice.